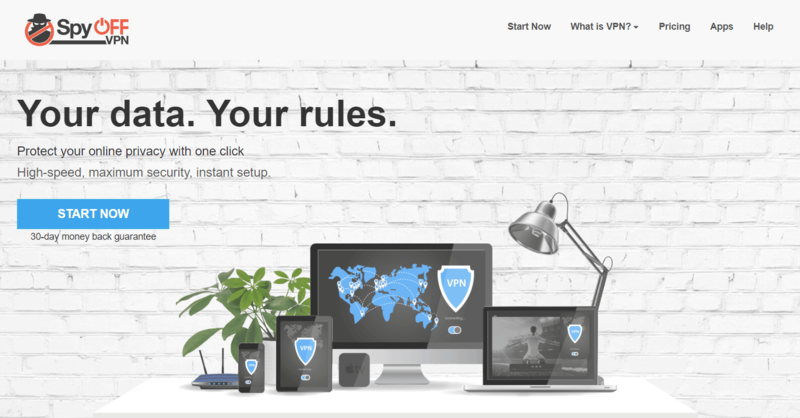 SpyOFF VPN Review - Slow Speed, But Worth It? 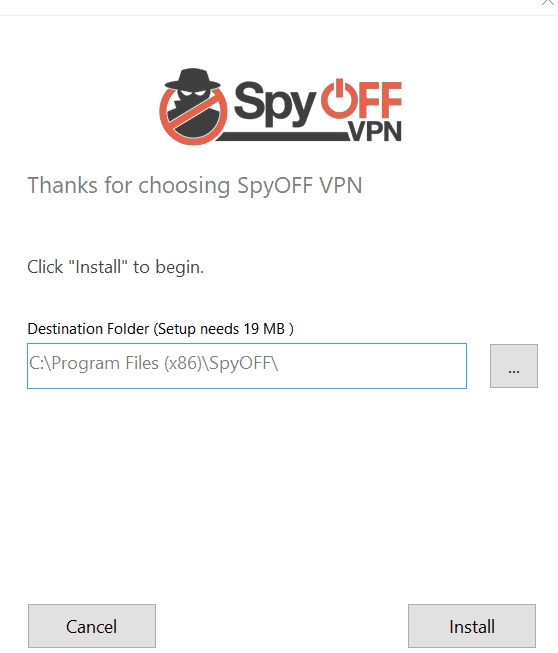 In this review, I’ll go through the ins and outs of SpyOFF VPN. 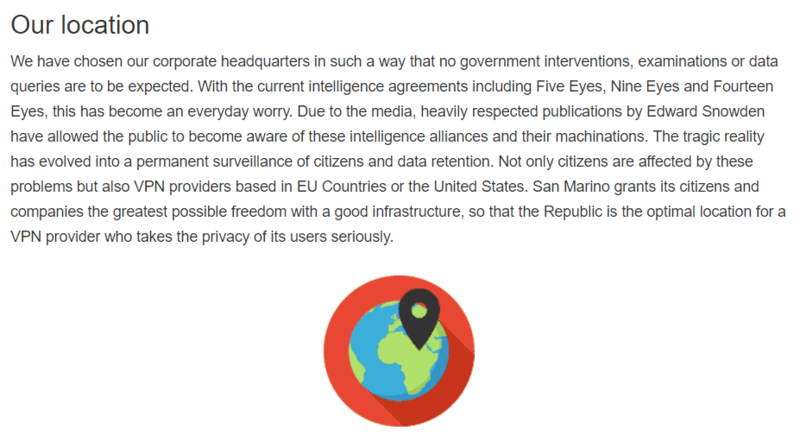 Sareta S.r.l., a 40-person company in the microstate of San Marino, has created SpyOff, a Virtual Private Network designed to create a truly anonymous web browsing experience. 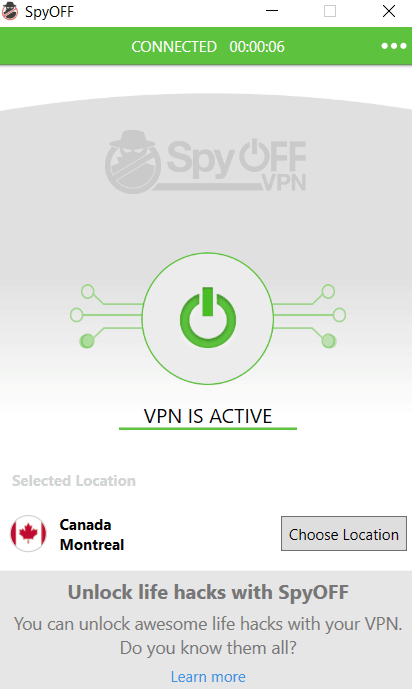 On paper, SpyOff has everything one looks for in a VPN. They claim to not log any of your information, they support a number of advanced VPN protocols/encryption standards, and they have additional security features built into the product to keep you protected at all times. But how good is it in practice? That’s what we’re going to find out in this SpyOff VPN review. We’ve dissected this product through hands-on testing, gauging the effectiveness of its overall use, speed, customer service, security, and more. SpyOFF has a lot to like. It is located outside of the jurisdiction of major surveillance alliances, it’s using some impenetrable security protocols, and it manages to even unblock a few Netflix servers. Couple that with torrenting and a user-friendly app, and you’ve got the makings of a solid VPN. Let’s dive into the good. Surveillance alliances can undermine a VPN. There are 14 nations that pool their espionage information together to form three major alliances. SpyOFF is located in San Marino, which is a tiny sliver of land carved from the Italian peninsula. When you hear that, you might immediately assume that SpyOFF is under the jurisdiction of the 14 Eyes Surveillance Alliance. San Marino is considered a “microstate” that exists with its own sovereignty. They share the Italian language and culture, but not most of the country’s laws, including surveillance and data retention. San Marino actually has no laws within their legal system that would force a company to disclose the information of their customers. In fact, San Marino enforces a double criminality law for requests for information from foreign courts. That means that a petition can only be upheld if the crime in question is threatened with a minimum sentence of one year’s imprisonment. That keeps you fairly safe from government spying efforts, and since SpyOFF does not hold onto any log information, they’d have nothing to turn over even in the event of a request. That’s not to say their logging policy is perfect. We will get to that under the cons section. SpyOFF uses a number of different protocols, including OpenVPN, the undisputed master of the protocol game. On top of OpenVPN, they also offer PPTP and L2TP/IPsec protocols. Both OpenVPN and L2TP/IPsec run using state-of-the-art AES-256 bit encryption, which is the mack daddy of all encryption standards. This is the level of encryption used by government agencies like the FBI and NSA. If it can fend off Russian hackers, it can protect your torrents with ease. SpyOFF breaks its protocols down into three categories. The Ultra Secure: This is the most advanced and secure route. It uses OpenVPN and AES-256 to keep you as safe possible. Balanced: This uses L2TP/IPSec paired with AES-256. It’s faster than OpenVPN as more security calls for less performance. However you’re still using AES-256 so if you’re relatively confident in the network you’re using this could be an efficient and secure option. High Speed: This option sacrifices security for speed. It is by far the fastest, but you’re using PPTP protocols and AES-128 Bit encryption. Not only is the encryption weaker, but PPTP is highly outdated and can be hacked in under three minutes. You’re not locked into one after making your choice, so feel free to move between them at will. If you’re at home, you can try one of the lower security modes. 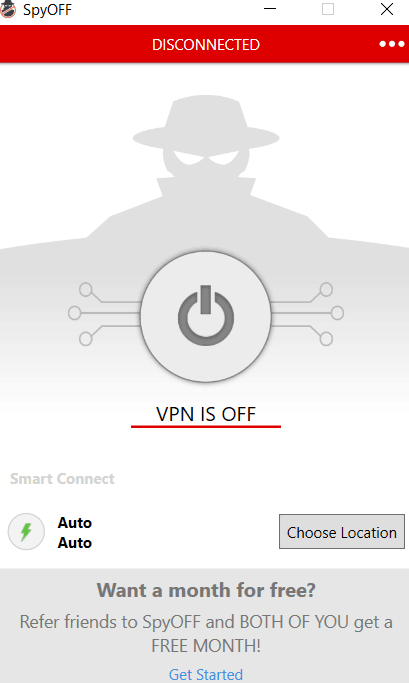 If you’re connected to a hhigh-securityrisk option like public-wifi make sure to use OpenVPN. When you torrent, you connect to the computers of other users to download large files piece by piece. It should be a relatively simple and secure system, but cybercriminals have begun using it to gain remote access to your computer. Connecting to a VPN keeps you safe from a cyber attack. Except, only a few VPNs work flawlessly with torrenting. They restrict VPN access to a select few servers. We tested their torrenting ability back in May of 2018. We attempted to download Martin Luther King, Jr.’s famous “I Have a Dream” speech in audio format. The download started and went through quickly without a hitch. Before 2016, VPNs were a godsend when it came to accessing geo-blocked Netflix content from all over the world. Someone in France would connect to their VPN, select a server in the U.S., and boom, they were watching unrestricted content. Well, Netflix caught onto that game. One dark day in 2016, VPN users logged on and came face to face with a black screen of doom. Netflix had unleashed one of the world’s most advanced VPN blocking systems to stop VPN users in their tracks. The Netflix VPN ban had begun. Still, a number of VPNs have managed to circumvent Netflix’s blocking efforts. It depends on not only the VPN you’re using, but which server you’re trying to access. We tested four of SpyOFF’s servers and were pleased to find that one out of the four completely unblocked the Netflix service. The server in question was based out of the United States. We also tested servers in the UK, Canada, and the Netherlands, but all of those struck out. This puts SpyOFF in the company of some heavy hitters that have also managed to get around the Netflix ban, like ExpressVPN. A VPN client does not have to be complicated. Sure, it does some complicated work, but it should be so easy to download, install, and use, a grandma with no computer knowledge should have no issues turning it on. That’s not always the case. Some VPNs are incredibly difficult to use, or crash unexpectedly. SpyOFF, however, keeps things simple. Installation occurs on the user dashboard, after logging in with your username and password through their official site. Choose where you want the file to download and away you go. I was impressed with how quickly the application downloaded onto my laptop, which was running Windows 10. It was so fast I didn’t even have a chance to snap a screenshot of it. Once it was downloaded, the application opened. Before taking me to the sign in screen it went through a few of SpyOFF’s features. After that, I was able to log in with my username and password. That took me to SpyOFF’s main screen, where I could easily select my server and connect. 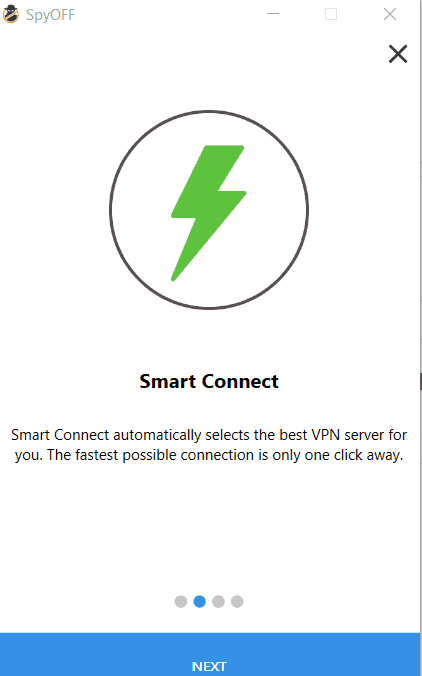 You can also use their Smart Connect service to automatically connect to the fastest server they have. Once I had selected my server, (in Canada, eh?) the service connected within seconds. Once I was logged on I was able to browse relatively easy. There was little-to-no lag and changing locations was simple. SpyOFF places no limits on your ability to change servers, so it’s just a simple click and you’re off to some other corner of the world. It’s always great to see a service making use of a built-in killswitch. A killswitch senses the presence of a DNS leak, which could potentially expose your original IP. Once that happens, the switch activates and the system automatically disconnects. No VPN should have DNS leaks, but they do happen. And if/when they happen, you’d never know. The only way to be 100% protected is to have a killswitch, and SpyOFF has given you that added protection. You want to make sure that the VPN you’re using has a wide array of servers to choose from. The first time that we reviewed SpyOFF we were not impressed with their selection. At the time, they offered only 395 servers. While that seems like a lot, it’s nothing compared the several thousand offered by services like NordVPN. What’s more, the servers they did have were spread out over a measly 25 countries, mostly found in North America and Europe. They’ve made some big improvements since then. This is a major improvement and we applaud SpyOFF for the big upgrade. We have a user-friendly app in a safe jurisdiction, with a large server park, a killswitch, and excellent security protocols. Take a deep breath and let’s sift through the bad. SpyOFF is not logging your data, so what is this doing in the con section? So where does the con come in? It turns out SpyOFF doesn’t own their servers outright. They rely on third-parties to rent access and re-sell it to you. This is not uncommon in the VPN world. In fact, we’ve found that many VPN companies play this misleading game. So you actually have no idea who has access to your data once you connect to these servers. SpyOFF isn’t logging you, that much is certain. But who is to say those other services aren’t holding onto your information? We can accept some gray areas, but this is just a little too gray. We ran SpyOFF through two speed tests, and we decided to challenge them at their very best, using the “High Speed” option. According to SpyOFF, this should yield their highest speed results. When the dust settled, SpyOFF was unable to place higher than 54th out of 78 VPNs in terms of speed. Not a great showing at all. Definitely not enough to make our list of the fastest VPNs. We started out with a benchmark speed of 98 Mbps on the download, and 53 Mbps on the upload. We connected to SpyOFF servers in both the Netherlands and the U.S. and recorded the results. At its very fastest, it’s sapping away 50% of our benchmark speed. Things got worse when we tested their U.S. server. This was a slowdown of more than 70%. Remember, this was their “High Speed” option with limited protection, so what must happen when you’re beefing up the security and using OpenVPN? SpyOFF supports Mac, Windows, Android, iOS, and Linux platforms. That’s fairly inclusive, but not enough. There’s some router support, but not for any old router. You have to open up your wallet and fork over a lot of cash to purchase their VPN FlashRouter. That’s the only way to ensure that your smart home technologies remain protected. Televisions, gaming consoles, and other internet-connected devices have no SpyOFF app, and no easy way to protect the network that they’re attached to. If SpyOFF supported common routers we would likely give them our approval. But something about forcing users to purchase their expensive hardware just rubs us the wrong way. 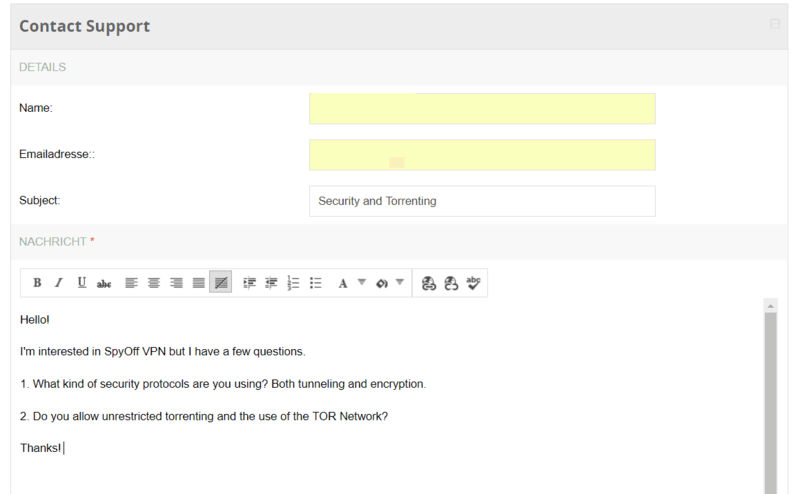 DNS leaks and WebRTC leaks betray the purpose of a VPN. When a leak occurs, it’s bleeding your original IP address out of the VPN tunnel, exposing it before the eyes of your ISP. When we initially tested SpyOFF, it received a clean bill of health. We re-tested them for this review, and the results were not good. Out of the four leak tests we performed, SpyOFF failed two of them. We also found a potentially malicious software attached to their installation file. Thankfully, there is a killswitch option available, but the presence of the malicious program in particular is grounds for some serious concern. There’s no live chat. That’s not shocking as only the tip top tier VPNs have this. SpyOFF has a contact form through its support page, though. I filled out the form and asked a rather simple question. It has been more than 15 hours since I sent this query and I have yet to receive a response, nor did I receive any kind of automated message saying it had been received. SpyOFF’s three payment plans are all identical as far as features go. The difference lies in their commitment period. Monthly – $12.99 per month. The most costly of the three but carries the most flexibility. Six Months – Billed as $65.94 every six months. Boils down to $10.99 per month, which is still quite high compared to many of the other VPNs we’ve reviewed. Sixteen Months – Billed as $89.60 every 16 months. 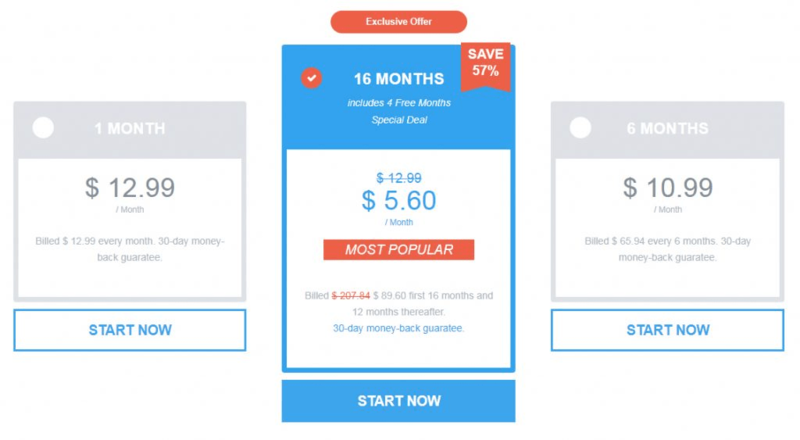 This option breaks down to only $5.60 per month. While this is the most affordable option, it does require a long commitment. All plans include a 30-day money-back guarantee. They accept a number of payment options, including SEPA Direct Debit, credit card, PayPal, and BitPay. 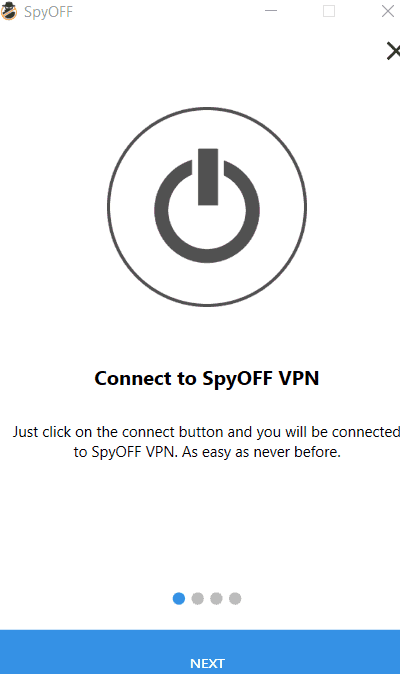 Do I Recommend SpyOFF VPN? It started off promising. Their jurisdiction is great and the app is user friendly. I love that it includes a killswitch, and their server park is growing at an impressive rate. But their high speed option was laughably slow, and the presence of IP leaks undermines the entire product. Not to mention the malware we found clinging like a barnacle to their installation file. Their no logging policy was impressive at first, but it loses some of its luster when you realize that they don’t control the servers. The final nail in the coffin of this VPN was the slow and unresponsive customer service. It’s expensive too. There are much higher quality VPNs that we’d recommend for the same price range or less. 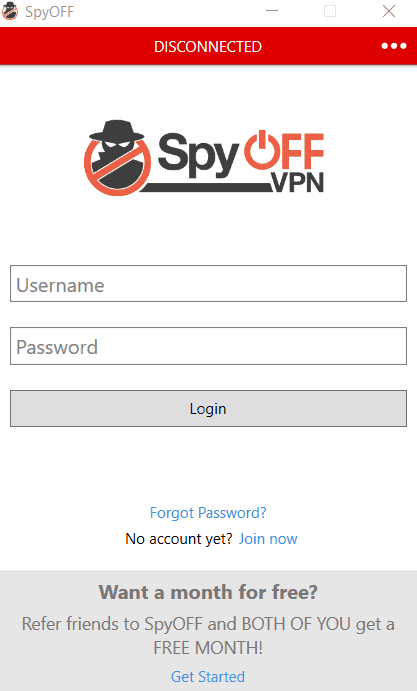 What’s your experience with SpyOFF VPN? I’m always happy to hear your thoughts.